Since today will have one extra second added to it, I thought it would be a good time to talk about calendar corrections in history. We'll avoid the modern arguments about what actually constitutes a "year" and go back to a simpler time. Readers of this blog are probably familiar with the pope's work to "fix" the calendar when he realized that the Julian calendar was "off" by several days. Sure, the Julian took into account that a "year" is actually 365 and a quarter days, but it wasn't exactly a quarter-day off, and so adding a day every four years wasn't sufficient to even things out. Every 131 years, the solstices and equinoxes would be off by a day. This was a real problem for the Church, because over the centuries Easter started shifting to summer, rather than spring. The Leap Day would move to after February 28 (it had been tucked in before February 25). The date of Easter would be calculated differently. A Leap Year that is divisible by 400 will not have a Leap Day. Ten days needed to be omitted from the calendar, to bring it back into alignment with the solstices. Accordingly, in 1582, the day after Thursday, October the 4th, was Friday the 15th. The 1582 change gave rise to a slight oddity for historians, because technically, every date prior to October 4th, 1582 is a Julian date, but also has a corresponding Gregorian date that is several days different. How you count it depends on whether you consider the date to be just a label given by those who were there at the time, or a certain number of days prior to the present day. Or its important if you want to declare the anniversary of an event. Anyway, enjoy your extra second; it will be added just before midnight, so feel free to stay up so you can say you remember the time when a minute was 61 seconds long! *Copernicus had dedicated his work De revolutionibus orbium coelestium (On the Revolutions of the Celestial Spheres) to Pope Paul III, hoping it would save him from potential hostility for his radical thoughts. Had Paul called, Copernicus probably would have come running to join the team of calendar reformers; alas, he had died in 1542.
mighteth the boones and causeth goode and gladeth and lighteth all men that use it. The leves layde under the heade whanne a man slepes, it doth away evell spirites and suffereth not to dreeme fowle dremes ne to be afeade. But he must be out of deedely synne for it is an holy tree. Strengthens the bones and causes good, and gladdens and lightens all men that use it. The leaves, laid under the head when a man sleeps, do away with evil spirits, and will not allow one to dream foul dreams or be afraid. But he must not be in a state of sin, for it is a holy tree. The British Library has a manuscript (Royal 12, D xvii) known colloquially as "Bald's Leechbook,"* a ninth-century medical text written in Old English. 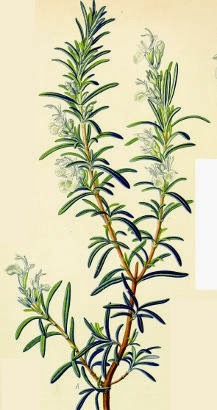 Rosemary is mentioned in a number of remedies, for fever, horses leprosy, and toothache (always mixed with multiple other substances). It is highly likely that the Saxons found rosemary growing all over England because of its introduction by the Romans centuries earlier. After the Fall of Constantinople in 1453 to the Turks, Nicholas of Cusa (c.1400-1464) wrote De pace fidei (On the Peace of Faith), in which he envisioned a conference in Heaven of representatives of all religions, including Islam and Hussites (the followers of Jan Hus were one of the first Christian Protestant movements, over a century before Luther). The imaginary conference concluded that it was possible to have a single unified religion, even if it manifests in many different versions with separate practices. After all, the Roman Catholic Church had co-existed with the Eastern Church for centuries; the Eastern Church may not have recognized the authority of the Pope over the East, but the East and West did consider themselves two parts of the same faith. Nicholas clearly prefers and exalts Christianity, but is willing to find accord with others. He had written Cribratio Alchorani (Sifting the Koran), which acknowledges that Islam and Judaism still possess seeds of the truth. Let me be clear: Nicholas doesn't treat Islam or Judaism as equals with Christianity—in 1451 he had used his authority as a bishop to require Jews in Arnhem to wear badges, and he had imposed other restrictions on Jews that were later lifted by Pope Nicholas V. The fact, however, that a well-known Catholic prelate and respected theologian could write on and publish such tolerant ideas was remarkable for the time. Nicholas of Cusa (c.1400-1464) believed in using reason to determine how the universe worked. He did not exactly take a "scientific" approach: he argued from his understanding of metaphysics and, in some cases, numerology. His guesses, however, were better than some early scholars' observations. Because he could not accept that God was finite, and since God is not separate from the entirety of the universe, he argued that the universe must by necessity be infinite. Also, because God must provide the center for His own totality, the Earth cannot be at the center of the universe—that would mean Earth was the center of God. Not being at the center of the universe, the Earth cannot be immovable, and it, along with the Sun, must be in motion just like every other observable heavenly body. This idea influenced Giordano Bruno. Again, denying perfection for anything but God, he would not accept planetary orbits as perfectly circular, paving the way for Kepler (who referred to Nicholas as "divinely inspired") to design elliptical orbits in his planetary theory. Cusa's thoughts on what we now call infinitesimals in his De Circuli Quadratura (On Squaring the Circle) helped Kepler out when trying to calculate the area of a circle, by picturing it as an infinite series of triangles. Cusa's reasoning for this was that the circle encompassed all other forms. Cusa's and Kepler's work was later important to Leibniz' Law of Continuity. Tomorrow: his views on bringing religions together. American History has a charming anecdote that the head of the US Patent Office once declared there was nothing left to invent. The background for this fable is explained here. Someone in 2010 said that we create as much data in 2 days as in all of 2003. Our ability to find and learn new things looks like it will never match the things there are to learn. With the amount of knowledge being gained rapidly accelerating, why don't we know everything yet? Will we know everything? endowed with suitable faculties and activities; ... there is in them a discernment that is natural and in keeping with the purpose of their knowledge, which ensures their natural inclination serving its purpose and being able to reach its fulfillment. If that is true, he says, then limits to our ability to know things must be built-in by our Creator for a purpose. And that purpose is that, at the end of our reasoning, when reason fails, we must turn to faith for the ultimate answers. For this, Nicholas has been declared an anti-intellectual by at least one prominent modern scholar. But this misses his point: until we reach the limits of what we can figure out, we must travel as far as we can with reason. Just how far Nicholas of Cusa let his reason take him (and in ways that were appreciated by men like Bruno, Copernicus, Galileo and Kepler) I will explore this week. Yesterday I mentioned Gervase of Canterbury and his fairly unremarkable life. What follows is the reason he makes an appearance in footnotes in astronomical texts. This year on the 18th of June,[*] when the Moon, a slim crescent, first became visible, a marvelous phenomenon was seen by several men who were watching it. Suddenly, the upper horn of the crescent was split in two. From the mid point of the division, a flaming torch sprang up, spewing out over a considerable distance fire, hot coals and sparks. The body of the Moon which was below, writhed like a wounded snake. This happened a dozen times or more, and when the Moon returned to normal, the whole crescent took on a blackish appearance. Scholars and astronomers have puzzled over this. Astronomer Jack Hartung in the September 1976 issue of the journal Meteoritics proposed that they had witnessed a meteor strike that created the lunar crater "Giordano Bruno." Recent photos by Apollo made it, in his opinion, a candidate for a young crater only 800 years old. Hartung had his critics, but without new data on the crater, the verdict could rightly claim to be "up in the air." Until years later a student named Paul Withers in Weekly Scientist pointed out an obvious flaw. An impact great enough to create the 14-mile wide Giordano Bruno would have thrown "10 million tons" of debris off the lunar surface; the ejecta in short order would have created unbelievably spectacular meteor showers in Earth's atmosphere. These meteor showers were not noted by monks in England or any other of the sky-gazing cultures that dotted the globe at the time. So what did the monks see? His guess is that they were looking in the right place at the right time to observe a meteor entering Earth's upper atmosphere between their line of sight and the horns of the crescent moon. For a modern astrophysicist's view on Gervase' chronicle, see Brian Koberlein's Google + post for today, June 25th, called "Mining for Science." *N.B. The Proleptic Gregorian Calendar (used for dates prior to 1582 because of a necessary correction) turns this date into June 25th, meaning today is the 834th anniversary of the monks' observation. Gervase of Canterbury (c.1141-c.1210) was a monk of Christ Church in Canterbury. He was ordained on February 16, 1163 by Archbishop of Canterbury Thomas Becket (who would be assassinated in 1170, canonized by Alexander III a few years later, and become the focus of the most famous shrine in England). Gervase had a fairly undistinguished career as a monk, and his "importance" for us is in his connection to other people and events. He was involved in the dispute between the monks of Christ Church and Archbishop of Canterbury Baldwin of Forde. Baldwin disapproved of the luxury in which the monks of Christ Church lived, derived from the donations made by pilgrims to the shrine of St. Thomas Becket. At one point, Baldwin had the entire monastery confined under house arrest for a year and a half. Gervase was one of the monks sent to inform Baldwin that they were making an appeal to the pope. Ultimately, the monks were given their freedom and normalcy restored (except that Baldwin appointed Roger Norris, a pretty ineffective administrator, as their prior). For a brief time Gervase held the position of sacristan (the person who takes care of the church and its contents), working for the Archbishop Hubert Walter. ...and that's about it for Gervase, except for one little thing that has intrigued historians and astronomers for centuries. Gervase kept records and wrote books, such as a history of the Archbishops of Canterbury and his Mappa Mundi, which lists bishoprics and ecclesiastical houses in England, Wales and Scotland. He was also the chronicler of his monastery, and on the night of June 18th, 1178,* he recorded something curious and previously unseen. ...but what the event was, and how June the 25th is actually the anniversary of the event on the 18th, I'll save for tomorrow. *The same year this was happening in Italy, as mentioned on the June 20th post. Approximately 1100 mappae mundi (maps of the world) have survived from the Middle Ages; about 200 are separate maps; the rest are in books. Maps of the world were obviously limited by knowledge of geography. This did not deter medieval cartographers, however, since maps existed for along time not as guides for travelers, but as diagrams of the layout of God's creation. Minutiae weren't as important as portraying the overall plan, or showing a particular feature. For instance, Gervase of Canterbury's Mappa Mundi was drawn up specifically to show the bishopric s and ecllesiastical foundations of England, Scotland and Wales. One of the most common of the map designs was the T-O design, called that by modern scholars because it resembled those letters. The "T" was the division of the major landmasses with the enormous Asia topping Europe and Africa; "O" was the encircling Ocean. Cicero's Dream of Scipio (in which a vision of the world is viewed in detail) was very popular in the Middle Ages for what it had to say about the world and the divine. Macrobius' (5th century CE) Commentary on it was how many readers became familiar with it. Many copies of the Commentary include mappa mundi of the type therefore called Macrobian. The Dream includes a description of the various zones, cold to temperate to hot to temperate to cold. Only the temperate zones were considered habitable. Fourteen manuscripts of Beatus of Liébana's (c.730-800) popular Commentary on the Apocalypse of St. John include the quadripartite-style map that squeezes the Antipodes into the extreme south. The most famous and most detailed maps provide the most variety and data and start to approach the realism and usefulness of modern cartography. The symbolic value of the mappae mundi began to be replaced by the need for accurate information to aid in travel and, especially, navigation on the seas. The new "Portolan Charts" became far more valuable to have and reproduce, and the number of mappa mundi were produced less. If you would like to see some maps from across the ages, a good start is the Imaginary Museum. *An extra tidbit: "orient" comes to Middle English from Latin via French and the verb oriri, "to rise"; once in English it starts being used for the direction itself in which the sun rises. As the unknown becomes close and familiar, imagination must seek new realms further away. Modern fiction doesn't write about alien life on the Moon or Mars or Venus, since we now "know" those spheres. In the Middle Ages, it was assumed that fantastical lands and creatures existed "over there." As far lands such as Africa, for instance, began to be explored and found mundane, the fantastical was mentally placed in a more distant spot. The Antipodes (literally "opposite feet": the place on the globe directly opposite to where you are standing)* fascinated the Middle Ages for both philosophical and geographical reasons. On the one hand, the idea had come to them from the Classical World, and so was difficult to dismiss. This was the place that held creatures out of legend: Cyclopes, dog-headed men, Sciopods whose single large foot could be used as an umbrella when they lay on their backs, Blemmyae with faces on their torsos. On the other hand, the Medieval idea of symmetry demanded that there be lands to the far south, balancing the known lands in the north. Especially as the idea of earth's roundness took shape, Africa wasn't enough to satisfactorily balance Europe and Asia. The Antipodes were also a natural extension of the theory of "zones." Since it became very cold up north, and hotter as you went south, it was assumed that the temperate zone enjoyed by most of Europe had a counterpart below the equator which was equally inhabitable. Below that, of course would be the area that is opposite the Arctic: the Anti-Arctic, or Antarctic. Yonde in Ethiopia ben the Antipodes, men that haue theyr fete ayenst our fete. For if there were any solid body in equipoise at the centre of the universe, there would be nothing to draw it to this extreme rather than to that, for they are all perfectly similar; and if a person were to go round the world in a circle, he would often, when standing at the antipodes of his former position, speak of the same point as above and below; for, as I was saying just now, to speak of the whole which is in the form of a globe as having one part above and another below is not like a sensible man. But sensible men apparently did not read the Timaeus, or never grasped the concept of "up" and "down" being relative to where you were standing. A universally accepted map of the world was unknown; maps of the world typically took one of four forms, which we will look at tomorrow. *Have fun finding your antipodal point here. Sing cuckoo now. Sing cuckoo. *There is disagreement on the meaning of "uerteth"; is it for "verteth" meaning "turns" (the buck is looking around for a doe?) or does the "v" sound indicate the fricative "f" for "ferteth" meaning "farts" (Middle English ferten = "to fart"; indicating...the richer diet of spring means life is being generated?). I have chosen "farts" simply because it rhymes with "starts" and gives me a chance to include this footnote. Happy Summer! According to legend, a rich widow named Berta di Bernardo left 60 coins in her will for the construction of a campanile, a bell tower, for St. Mary's Cathedral in Pisa. A 55-meter tower was planned, belvedere style so that people could walk up the outside and enjoy the view. Ground was broken August 9, 1173. The architect/builder is unknown. Either he was simply undistinguished, or he was careful to keep his name out of the public eye once the project was begun in order to avoid the inevitable ridicule. Pisa was built at the junction of two rivers, the Arno and the (now dried and gone) Auser; when the builder dug a 3-meter deep hole for the foundation, he found only river clay and sand. This lack of bedrock did not deter him. He proceeded to build what was designed to be a 14,000-ton structure on top of this soft foundation; by the time he got to the third level in 1178, it had already started to list to one side. They had no way to change the ground on which it stood, and they didn't want to give up the project, so they built the next floors with one wall higher than the other, so that the upper floors wouldn't slant. A series of financial problems and wars with neighboring city-states (mostly Florence, but Pisa also lost a major conflict with Genoa) meant the campanile wasn't finished until 1319. Nothing they did could fix the increasing list. But then, nothing they did would have. Adding the bells? More leaning. Deciding to add an impressive 3.5 ton additional bell? More leaning. Even so, the tower was only leaning by five degrees in 1837, when Alessandro della Gherardesca decided to turn an embarrassment into a tourist attraction by exposing the famous flawed foundation. He dug around the base...below the water table. The space flooded, the clay and sand softened more, and over the course of a few days, the tower leaned another meter! In 1934, the idea arose to drill holes in the foundation and force grout into them. It looked good on paper; in reality, it increased the tilt. Tinkering in 1966 and 1985 just made it worse, and the tower was closed to the public in 1990. Years later, the combination of a steel corset around the base, concrete, and counterweights were supposed to be the ultimate fix. They weren't, although they did almost cause the whole tower to break apart from stress. Finally, someone decided to go to the root of the problem. They dug away at the foundation on the other side of the tower, hoping it would lean back the way it had come. A little over 800 years of tinkering since the problem first appeared, and not only was the tilt reduced, but the tower was stabilized and re-opened to the public. Once again, tourists can climb the tower and take photographs looking out over Pisa, rather than just ground-based pictures of them appearing to hold up the tower with their hands. On April 19, 1213, Pope Innocent III declared via papal bull that a great council would be held; the Fourth Lateran Council started November 11, 1215. One of the reasons Innocent felt the need for reform was the poor performance of the Crusades: the Third had been disappointing in its result and the Fourth a downright disaster in its execution. Organizing the Fifth Crusade was one of the purposes of the Council; Innocent produced 70 additional decrees which were generally accepted with little argument. One change created by the Fourth Lateran was in marriage. Prior to 1215, marriage was simply a legal contract between two parties, not a sacrament. * Innocent made it a sacrament, making marriage a much more important bond and presided over by the Church. He next declared that marriages could not be clandestine: they must be proclaimed publicly ahead of time so that anyone who knows a legitimate impediment against the marriage has a chance to make it known. He warns, however, that lying about such impediments will bring the wrath of the church down on you. It should not be judged reprehensible if human decrees are sometimes changed according to changing circumstances, especially when urgent necessity or evident advantage demands it, since God himself changed in the new Testament some of the things which he had commanded in the old Testament. Innocent was pope from January 1198-July 1216, during which he made many changes, some of which are still with us. *Pre-1215, there were only 5 sacraments: Baptism, Communion, Confirmation, Holy Orders, Last Rites; 1215 established Marriage and the practice of individual Penance at least once per year. The Leadership Conference of Women Religious is making news, and my desire to make this blog not just interesting and varied but also relevant prompts me to talk about Julian of Norwich. Mystics—people who attain knowledge of the divine not by rational study but by a direct connection or intuition, often during a state of ecstasy—are known in all faiths and all eras. Julian of Norwich was an anchoress (a female anchorite, a hermit; she lived a life of religious seclusion) who had a series of mystic visions of Jesus in 1373 (she was about 31 years old) while on what was thought to be her deathbed. She recovered on May 13, and wrote down a short version of the visions. In about 1393 she wrote a much longer version, Sixteen Revelations of Divine Love, possibly the first book written in English by a woman. And thus I saw that God rejoiceth that He is our Father, and God rejoiceth that He is our Mother, and God rejoiceth that He is our Very Spouse and our soul is His loved Wife. Church authorities at the time did not challenge her. This cannot be because she wrote in obscurity: there are plenty of contemporary references to her, and she was operating in Norwich, the second most populated city in England. Either the church did not consider her ideas likely to become influential, or they were not shocked by them. After all, she did not say God was solely mother; she simply allowed for feminine qualities as well as masculine. Perhaps this all-inclusive approach was sufficiently non-threatening to be accepted as non-heretical. Perhaps the Middle Ages was willing to embrace the importance of the feminine along with the masculine. The Classical World and the Middle Ages wrestled with the cause of the tides for centuries. Although one early scholar (Alpetragius, who flourished in the late 1100s) felt it was caused by some general motion of the world/celestial spheres that ran from east to west, most others (such as Bede and Gerald of Wales) felt it had a stronger connection to the movement of the Moon. Remember that there was no working theory of gravity yet; just a feeling that substances could be heavier or lighter depending upon their composition and gravitate (see? in this enlightened age, the concept of gravity pervades even our language) toward like substances: solids fall to earth; liquid (containing more of the element of water) flows to a lower spot to find its kind; fire yearns upward through air, because fire is even "lighter" than air. For Grosseteste, light imparted force. Rays of light could carry with them the power to generate heat, for instance (see his theory on the sun). He postulated that, when the Moon rose above the horizon, its rays impressed against the waters and pushed them ahead of it, toward the west. This was not as simple and direct as a physical object pushing against water, and so water didn't rush to the shore as soon as the Moon rose. The rays of the Moon started pushing against the sea closest to it, pushing that water toward the observer. When the Moon was overhead, its rays had pushed as much water as it could at that time. Once the Moon passed the zenith and was over land, then the waters started to recede. The Moon then passes west and under the earth, at that point causing (somehow) the tides again. Grosseteste admits that we don't know everything about this process, and my summary is a radical simplification of his detailed analysis. He notes the changes in tides as the Moon changes its declination, and theorizes that the Sun also "helps" the Moon in some manner. For more detail, find the Question on the flow and re-flow of the sea (available in Isis , Vol. 57, No. 4 (Winter, 1966), pp. 455-474 in an article by Richard C. Dales) and enjoy. The "Great Charter" was signed on June 10, 1215 by King John. After the Norman Invasion of 1066, the kings of England started to rule more as the monarchs we think of today, abandoning the English custom of a council of wise men, the witenagemot, that had aided kings for centuries. Under strong and charismatic individuals such as Henry II (who ruled from 1154 until 1189), this system may have worked, but King John was not like Henry II. He was called "Bad" King John because he taxed people so heavily. He was called "Lackland" (in Old French, Johan Sanz Terre) because he lost the Duchy of Normandy to King Philip II of France. For these and other reasons, he lost the support of his barons. The barons decided they needed to return the kingdom's governance to a system that allowed them more input. To that end, they conferred and agreed to draw up a great charter, which was drafted by the Archbishop of Canterbury, Stephen Langton. Although Langton may not have been as affected by John's whims as the barons, he had been the cause of a dispute between John and Pope Innocent III, which had resulted in John's brief excommunication. Langton definitely saw the need to curb John's ability to get himself and England into trouble. When John decided to tax the barons themselves in order to mount a war to regain lost provinces on the continent, the barons had had enough. The barons and Langton produced a document called the "Articles of the Barons" in January of 1215, which John rejected. The barons then armed themselves and marched to London, occupying it in May. 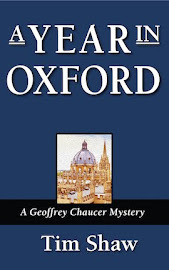 They confronted John at Windsor Castle, and he agreed to a meeting at a place called Runnymede. The Church was free to rule itself, especially in the appointment of bishops. On June 15th (797 years ago today), the Barons reciprocated by renewing their Oath of Fealty to King John. Of course, John had no intention of being bound by the restrictions of the Magna Carta, but that's another story. When Edward the Confessor died, he supposedly made a deathbed statement committing his kingdom into the care of Harold Godwinson. As the most powerful man in England after the king, he was a natural choice. Whether Edward actually made that statement or not, the witenagemot, the group of wise men who counseled the king, approved Harold as king. He was crowned on the same day Edward was buried. William was incensed. The report that Harold had broken a vow made on holy relics was so significant that it enabled William to procure the pope's blessing to depose Harold and take the throne. (Of course, William might have had help: Pope Alexander II was a former student of Lanfranc, who had been first an enemy and then a supporter of William and was not above exercising his influence on his former pupils.) The fact that William's army marched under a papal banner and blessing would have had a demoralizing effect on Harold's forces. Worse than the psychological effect, however, would have been physical exhaustion. The stories we hear in our grade-school history books about 1066 leave out a third party: Harald Hardrada. Harald Hardrada, King of Denmark and Norway, also believed he had a claim to England, since Danes had ruled it in times past. Harald landed in the north of England in September of 1066 with 300 longships, 15,000 men, and King Harold's brother, Tostig. On September 20 he defeated the first English forces he encountered. King Harold, however, met Harald five days later at the Battle of Stamford Bridge. Once Harold's forces managed to cross the bridge, he killed Harald and Tostig and defeated the army so soundly that only 24 ships survived to flee back to Denmark. This was not an easy battle, however, and the standoff at Stamford Bridge alone supposedly cost Harold about 20 of his best warriors and closest companions. ...and while Harold's army was recovering from their hard-won battle, the message arrived that William's fleet had arrived at Hastings, 300 miles away. The army (not recovered from their battle) had to march quickly south and meet William's fresh forces who had had plenty of time to prepare their defenses and pick the battle site. Who knows what would have happened if Harold's forces had been able to meet William's while at full strength? The years following the Battle of Hastings in 1066 are well-known, but history books too often leave out the crucial three weeks prior to the battle, when Harold and his English army performed herculean tasks to defend their shores. In 1051, when King Edward the Confessor was inviting more friendly Normans to join him in England, Duke William of Normandy visited. According to records made after 1066 but before William's death in 1087, William reported that Edward (who was celibate and would have no heirs of his own) told William that William would be his heir to the throne of England. When Edward died in 1066, Harold claimed that Edward had made a deathbed pronouncement, naming Harold his heir. The problem with all these claims? In primarily Anglo-Saxon England, the next king was chosen by the witenagemot, the meeting of wise men. Kings might name a successor, but the Witan was needed to approve a ruler. So who pressed their claim? I'll tell you the unhappy (for Harold) result tomorrow. *Note: This is about the only reason why anyone studying history cares about Guy of Ponthieu. Feel free to forget the name. Edward's life was a series of contrasts. Son of an English king (Ethelred The Unready), he nevertheless spent much of his life in Normandy, making Norman French friends. Although so pious that he was called "The Confessor," when he became king in 1042 he ruthlessly deprived his mother of all her estates because he felt she had neglected him as a child. Although his father-in-law was Godwin of Wessex, one of his most powerful retainers, he and Godwin were frequently at odds. When Edward asked Godwin to punish some of his subjects who had hassled the king's Norman friends, Godwin refused and raised an army to fight Edward. Unfortunately for Godwin, none of the other great lords wanted to join him, so Godwin found himself losing and had to choose exile for himself. Although Edward should have learned his lesson regarding Norman vs. Anglo-Saxon friction, Edward increased the number of Norman councilors. The Anglo-Saxon population disliked this so much that they supported Godwin when an invasion by his two sons, Harold and Tostig, took place in 1052. Godwin was allowed to return. Godwin forced Edward to send the Normans away. Although he had unhappy dealings with Godwin's family, when Godwin died in 1053, Edward named Godwin's son Harold the heir of Edward. Although he named Harold his heir, William of Normandy claimed that Edward had named William his heir in 1051. When Edward died in 1066, the stage was set for conflict. Early Anglo-Saxon England was filled with clans and communities that made policies and laws and settled disputes during a regular gathering called the folkmoot (meeting of the people), in which all free members of the clan or district participated. From before the 7th century until the 11th century, the folkmoot evolved into the witenagemot, the meeting (gemot) of the wise men (witena, singular witan). Sometimes this was called simply the Witan. The Witan consisted of the more powerful members of the tribe or district, and their function was nationwide, as advisers to the king. Although the term appears only nine times prior to 1066 in English records, and its functions are not documented—this was long before England's love of meticulous record-keeping—it is clear that an assembly of this kind had great importance prior to the political upheaval of the Norman Invasion. Witan was actually used in several contexts to refer to a group of advisers or decision-making bodies for different levels of society. We find references to theodwitan (people's witan), Angolcynnes witan (England witan), and one archbishop advised bishops, when they travel, to take a witan with them for help. *The term "Unready" meant not that he was ill-prepared, but that he was ill-advised; it is from rede which means "advice." Robert Grosseteste (c.1175-1235) is considered by some to be the founder of modern English intellectualism. Among other topics, he focused (pun intended) on light. One of his works seeks to explain how the sun produces heat. He determines that Method 1 cannot apply here. For heat to transfer from a hot object, there must be a medium through which it travels, and that medium will heat up during the transfer of heat. Clearly everything between the sun and us does not heat up. He decided that Method 2 is also insufficient to explain the heat, because the motion that creates heat is caused by two substances moving in opposite directions—for instance, rubbing your hands together to warm them up—and the sun's circular motion does not act upon a second substance moving in an opposite direction: everything up there moves from east to west. Method 3, he decides, must pertain. He reminds his reader that Euclid explains how a concave mirror can focus the sun's rays to cause a fire. He states that the sun's rays falling upon the earth are scattered, but reflection by a mirror or refraction by a (clear) spherical body can change the direction of the rays, focusing them via the medium of the dense air and generating heat. For him, this has much to do with the denseness of the medium: he tells us that the same amount of light falls on a mountaintop and scattering can be observed there, but the thinness of the medium of air disallows the generation of heat. The Middle Ages had some serious opinions about meals, especially about how many there should be, and when they should be taken. The need to break the all-night fasting in the morning was common among peasants and tradesmen who started their day early and got to work. It was not generally observed by the upper classes—perhaps because they slept later than peasants, and didn't get right to heavy work—and moralists frowned on it so strongly that some gentlemen felt the need to express shame for eating upon first rising. What eventually became the noon meal was considered the substantial meal of the day, a needed repast because of what you had been doing, and energy for the rest of the day. From the word meaning "to sup," supper was served later and was simpler, often involving soup or sops: bread dipped in some tasty liquid. ...and that should have been enough. The sun would be down soon, and sleep would beckon. There was, however, a trend among the profligate that peeved the moralists but delighted the partakers. If it wasn't enjoyed by "heads of households" then one pictures the younger generation unwilling to follow a philosophy of "early to bed, early to rise," and instead staying up late and carousing. I cannot help thinking that Taco Bell's "Fourth Meal" marketing campaign serves exactly the same population. The daily schedule of the medieval Oxford student was very different from what modern college students go through. For the first few centuries, there were no dorms, and students would room at a "Hall" connected to their college and run by a "Principal." Separate rooms devoted to lectures were not always available, and lectures were given in a room at the Hall or in the Master's own house or rented room. Fires were not allowed in college rooms—any college rooms—and the probable lack of chairs or benches meant you were standing in bitter cold for hours during part of the year. Lectures were given from 6:00 a.m. until 10:00, when the first food of the day was made available at the Hall. * Dinner was served from 10:00 until 11:00, followed by free time until noon. Afternoon lectures were given from noon until 5:00 p.m. Homework as we think of it (daily amounts of reading from a text that every student owned; regularly written essays) was unknown. Evenings were free, therefore, for gambling, chess, drinking and socializing; musical instruments could be played in the evening. NO jousting, hunting, or hawking were allowed. One reason given was that, since they were expensive pastimes and therefore the province of the wealthy, engaging in them created a social divide between students from different economic classes. Lectures might be offered on Sundays, or else they could be used for worship. Church holidays were free of lectures. At the end of the term, the student body and Masters were gathered together at a meeting called the collect. Masters would discuss each student in turn, listing attendance violations, "grading" performance, and then assessing fees. Tuition was collected at this meeting—hence the name. N.B., students paid for the learning they received, they did not pay up front. This is not to say that you could hang out in Oxford, skip classes, and save the money that your parents sent you with: skipping a lecture for a subject you were supposed to be studying meant a fine of two pennies! *This lack of breakfast will be addressed in the June 9 post. Some have noticed that his description of the origin of the universe seems to anticipate the Big Bang Theory; Mohr and Sattler go into more detail in One Book, The Whole Universe: Plato's Timaeus Today. The Middle Ages, however, had its own version of the origin of everything to which it compared Plato. St. Ambrose (c.340-397) considered the differences between Plato and Genesis to be Plato's "errors." Ambrose's student, St. Augustine, however, embraces the similarities, specially appreciating Plato's contention that, since the world around us seems pretty good to us, it must be because the Demiurge was determined to make a world that was as good as it could be. The growing field of philosophy found more and more use for Plato in developing a "modern" world view. Made the world into the shape of a globe, the ideal shape to encompass all other forms. Imparted circular movement to the world, as the most uniform and suited to an ideal shape. Created the soul of the world, linking all things on the earth with each other. But even later ages would learn to appreciate the idea of the Earth as a globe, that it rotates on its axis, and that the Earth is a complex ecosystem of interlocking parts. Not too shabby. Tens of thousands have damaged London and remain a threat. King Richard goes out to calm them down and promise them he will treat them well, but while he's doing that, they storm the Tower of London and behead the Archbishop of Canterbury (who is also Chancellor) and the Lord Treasurer—and at the same time they hassle the king's mother. But he meets with them the next day anyway—king's word is his bond, right? The rebel leader acts like a jerk (so we're told, by the guys on the opposite side of the argument), and is killed. The front of the line of rebels—standing far back—see him go from his horse to the ground. They suspect treachery, and start to raise weapons and get loud. The fourteen-year-old king spurs his horse forward, right up to the rebels, alone. He asks them if they really wish to shoot at their king. In the embarrassed confusion that follows, he raises his sword and says "You shall have no leader but me!" He tells them that all is well, Tyler has in fact just been knighted (which pleases the crowd, although it is completely counter to the idea of social equality behind which they marched), and that they should follow Richard to an open area outside of London. The crowd, enthralled that this boy, king by divine right, is willing to be their leader, follows him into open fields, which allows the nobles with 7000 militia (pulled together in the previous 48 hours) to surround them. The rebels are combed through to find the leaders. The followers are easily dispersed. The concessions offered by the king are revoked. Jack Straw and John Ball are found (according to Froissart) hiding in an old house, thinking they had escaped. John Ball is executed on July 15; presumably, Jack Straw is also executed around the same time. Other revolts against the upper classes took place in Europe, and statutes intended to restrict workers for the good of society were enacted several times over the next few centuries, but the Peasants' Revolt stands out in England for how quickly it surged, and how easily and quickly it was quelled. Wat Tyler and thousands of middle- and lower-class followers reached Blackheath by June 12th, and heard John Ball's famous sermon. Stirred with egalitarian fervor, they marched to London, crossing London Bridge unopposed the next day. Meanwhile, Jack Straw's Essex group had also arrived. They did not engage in widespread or mindless looting: their targets were symbolic of what they thought was wrong with the country. Only certain buildings were attacked. John of Gaunt would have been a target, had he been present. The king's uncle and a shrewd and powerful politician, Gaunt was thought by the crowd to be undermining the authority of the 14-year-old monarch. What the crowd likely did not know was that the same Lollard tendencies toward social equality and against church corruption that motivated John Ball were also of great interest to John of Gaunt. Fortunately for Gaunt--and history--Gaunt was patrolling the border of Scotland at the time. Still, the rebels found a target in Gaunt's home, the Savoy on the banks of the Thames, considered the grandest home in London. It was looted before being burned, and anything precious found therein was destroyed or thrown into the river. Legend says that a rebel who tried to keep a silver cup for himself was set upon by his comrades and killed. On June 13th, King Richard II addressed the rebels himself, offering them several concessions. Something in the quality of the bold young boy (he was 14) calmed them, and a parlay was agreed upon. Unfortunately, while Richard was addressing one group, another large group entered the Tower of London complex. There they found who they considered to be two of the architects of their troubled land: the Archbishop of Canterbury Simon Sudbury, and the Lord Treasurer Robert Hales. Both were dragged to Tower Hill and beheaded. On June 14th, Richard and the Lord Mayor of London,William Walworth, along with a contingent of soldiers, met the rebels at Smithfield to discuss the end of the revolt. Wat Tyler rode alone to address the king, but he was so insolent (so say reports) that Walworth hacked at Tyler's neck with his sword, whereupon a knight, Sir John Cavendish, killed Tyler by running him through with his sword. ...and then it got really interesting. The Peasants' Revolt was not just the result of a stirring sermon by John Ball. All of the counties of Kent and Essex were stirred up by an incident that started May 30, 1381. One of the king's servants went to the village of Fobbing and attempted to collect the poll tax that had been announced in 1379. He was refused any money, which prompted a visit by Chief Justice Robert Belknap to investigate and punish the villagers. He was attacked on June 2nd at the village of Brentwood. Walter "Wat" Tyler (we call him "Tyler" because he worked in the roofing trade) comes into the story as an outraged father who killed a tax collector who had molested Tyler's daughter. There is some confusion, caused by the presence of more than one Tyler in the crowd. A recently discovered account from the time suggests that, the rebels already having been stirred up in Kent, they chose a "Wat Tyler" from Maidstone to lead them on or after June 7th, after those rebels took Rochester Castle. Jack Straw is known even less, but he was one of the leaders of the rebels. Some historians think he was simply a pseudonym for Wat Tyler, but Froissart (who may not have observed the events, but was alive at the time and knew people close to the situation), makes it clear that Straw and Tyler were different people. Thomas Walsingham, a monk who wrote down much of the history of England during the reigns of Richard II, Henry IV and Henry V, claims Straw was a priest and led a group of rebels from Bury St. Edmunds and Mildenhall to London. There was also a John Wrawe, who had been a vicar in Suffolk and led a group from that county. A majority of the rebels on the move--mostly the large group from Kent led by Wat Tyler--met at Blackheath and heard the sermon from John Ball with the famous line "When Adam delved and Eve span, who was then the gentleman?" By June 12th, these groups were either listening to John Ball or approaching London from a different direction. Tempers were rising, and the lower classes were ready to make a statement. The lower classes were not just worked up by a sermon about social equality, or the statutes that tried to maintain wages at lower levels. At a time when annual taxation was unknown, the unexpected declaration of any tax could be a cause for concern: a tax that did not seem equitable was especially unwelcome. The Poll Tax of 1377 was a flat rate of 4 pence, and was do-able. Another poll tax in 1379, however, was not a flat rate, nor so small. Some of the poor were given reduced rates, but others had to pay the full rate of 12 pence, three times the rate of just two years earlier. Edward III died in 1377, leaving the throne to his grandson Richard II, aged 10. In 1381, the king being only 14, the country was still being run by regents who were considered unpopular, including the Archbishop of Canterbury (Simon Sudbury) who was considered the embodiment of a corrupt church, and the Lord Treasurer (Sir Robert Hales), who instituted the poll taxes. The air of majesty that surrounded a king still existed for the masses, and they considered the authority of these other lords (who included the king's uncle, John of Gaunt) improper. These factors were already reflected in some acts of social unrest taking place in the spring and summer of 1381. More on them tomorrow. The statutes that attempted to restrict the peasant workforce to pre-Plague levels of wages, etc., did not please the lower classes. Social unrest needs a nucleus, however, a focus, and one was found in John Ball. He concluded with exhortations to root out those who brought harm to the community: the lords of the realm, and the lawyers and justices and jurors. The crowd, roused to a frenzy, began the five-mile march to London. Before discussing the first "Occupy" movement--the Peasants' Revolt of 1381--I thought I would first briefly address the topic of peasants. Being "free" had disadvantages as well as benefits. The unfree peasant was tied to a lord and that lord's domains. His fate and his family's was bound to that place, and he worked for the lord. The benefit, however, was that he had a place to live, and the lord was obligated to make sure his tenants thrived (or else he would lose his workforce). You could free yourself by marrying a freeman, or else by running away and living elsewhere for a year without being discovered and dragged back (and likely punished with fines, etc.). Finding employment as a runaway peasant wasn't that easy, however. Something curious arises from a study of inheritance records: medieval English peasants often had saved sufficient funds to purchase their freedom; purchasing their freedom is rare, however, as evidenced by how much money they leave to their inheritors. Why would this be? The free peasant could rent land from a lord, or purchase and work his own land; his obligations to the lord (in the form of taxes/tithes) was less than that of the unfree peasant. The freeman could uproot and travel to greener pastures, if they were available. The lord, however, had no obligation to take pity on the freeman if the harvest was bad. Being free meant being free to sink or swim on your own. The unfree peasant had stable expectations for what he owed the lord that did not change from year to year and could be planned for. The lord could raise the rent on the freeman, if he felt like it. The unfree peasant was a dependent on whom the lord himself depended for labor. This symbiotic relationship lasted for centuries, until thrown off-kilter by the Bubonic Plague.